Well, 2017 has come and gone! Taking a look back at where our Buyers came from in 2017 gives us a little insight into why the market has been trending upwards in such an aggressive style and should continue through 2018. 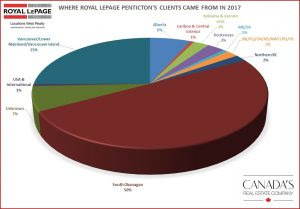 At Royal LePage we keep track of where the Buyers come from in all transactions, given that we have a 54% market share in the South Okanagan I would say we have a fair representation of what the market is doing, therefore these stats could be deemed fairly reliable. The South Okanagan: 50% of Buyers are local, either upsizing or downsizing depending on there wants and needs. 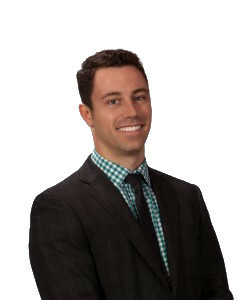 This isn’t a surprise as a healthy smaller market like the South Okanagan should rely on the majority of the Buyers being within the local area. Lower Mainland/Vancouver Island: 25%, that’s right, a quarter of all of our sales are derived from the Lower Mainland. These Buyers are cashing out and moving to our not so Hidden Gem anymore to seek retirement. These Buyers are used to aggressive sales & competing offers and this mentality is taken with them to the Sunny Okanagan. Anytime you have 25% of sales coming from a direct area, you can be sure they will stimulate any housing boom. As long as the Lower Mainland Real Estate Market is booming with the locals wanting to cash out and move elsewhere, be prepared for a Hot South Okanagan Market for awhile. Alberta: 6%, the Albertans are still coming, however not in drones like they were in the last major Real estate Boom here. We have seen our neighbors to the East lose their presence in our area of their past few years, at one time they were equal to that of the Lower Mainland Buyers. Now due to a slumping Oil/Gas sector I think more and more of them are staying put hoping and waiting for their Real estate Markets to improve. What does this all mean for you as a Buyer for 2018? Be prepared for a competitive year of Real Estate, as Spring draws near and the mountain passes clear we will see more out of town traffic bidding for a piece of Okanagan Heaven. They will bring with them cash and aggressive purchasing decisions, so get your financing ducks in a row before making an offer. Anything you can do to give yourselves the slightest edge in a hot market will improve your chances of getting your foot in the door here. Don’t count on a bubble bursting anytime soon, with historically low inventory and aggressive waves of retiring Vancouverites this could be the new norm here for awhile to come!